Certainly Giant Eagle is my favorite destination to shop all my groceries! However, with their fuelperks+ program going on, I feel like stocking up flour, sugar and butter enough for two years. Above all I earned perks with everything I shopped. 1 perk for every dollar spent. Oh and also at the Get Go gas station, 2 perks earned per Gal of gas bought. Hence, we used all our gas savings towards a three days travel to Hocking Hills State Park, Ohio on memorial day weekend! My heart still wanders in the Old man’s cave. So what are you waiting for? Sign up for an advantage card and start saving now! Also find additional details on fuelperks+, advantage card and app here! Between all this excitement, I almost forgot I owe you a cake! Lets jump right into it. 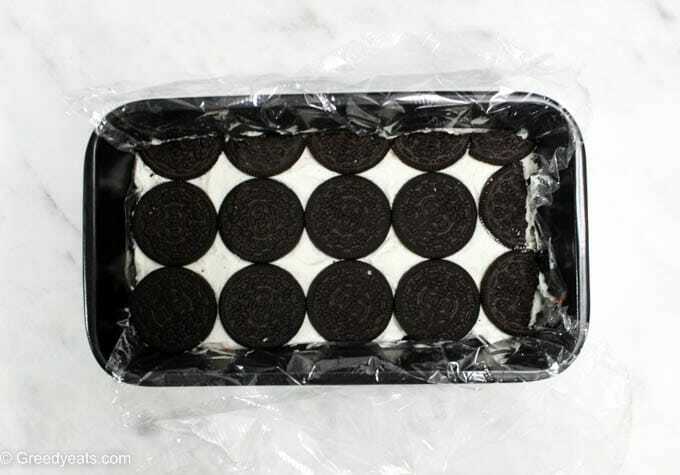 We will make this oreo strawberry icebox cake in a loaf pan. It is so easy to make. Needs a very few ingredients and comes together at ease. Instead of using store bought whipped topping/cool whip and jam. I used easy homemade strawberry filling (cooked on stove top) and freshly whipped whipping cream. You can switch these both to store bought when in a rush! The texture of this cake? Super creamy and light. Oh and the oreo cookies don’t get soggy at all. 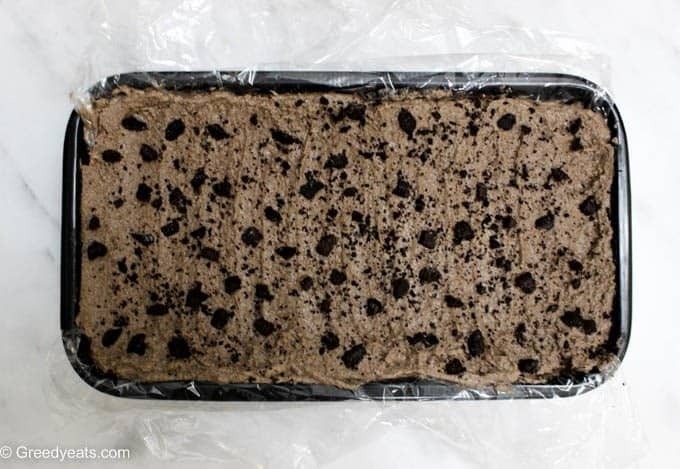 They only soften to produce a cake like texture in this fruity oreo icebox cake! I also used the cream of these sandwiched cookies to make my whipping cream sweet. That way the cake isn’t overly sweet and you don’t need much extra sugar in the recipe. Win win! 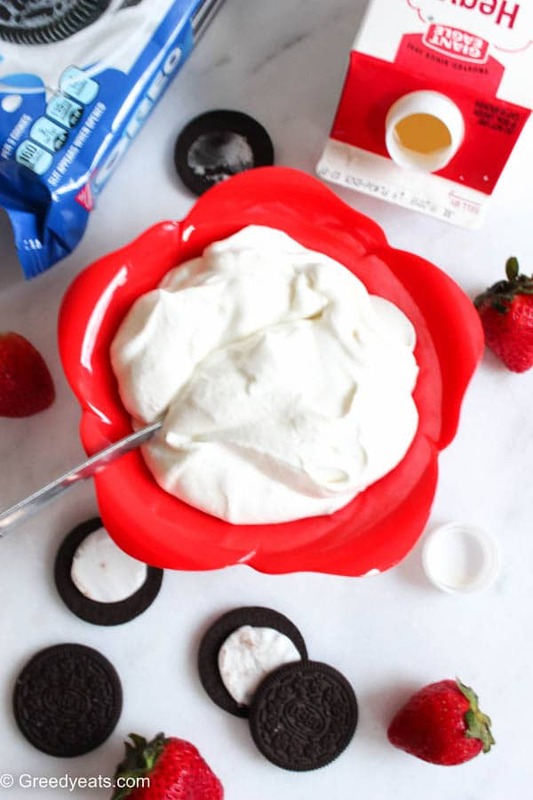 We will whip our cream using the oreo cookies cream and a little sugar to soft peaks. Most important: don’t over whip the cream as it can curdle very easily! For the topmost layer, I added some cocoa powder to my whipped cream to make it chocolate flavored! 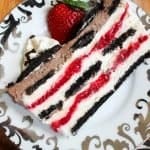 Featuring repetitive layers of fresh strawberry filling, smooth, light and silky vanilla cream with cakey oreos cookies! In short, I got your summer favorite redefined! There are 10 in total. But most of them are either oreo cookies(individual, cream removed), whipped cream or strawberry jam! Also there is chocolate flavored whipped cream for the top most layer. We will begin by lining a plastic wrap to our loaf pan. Because it ensures easy removal of our cake. Please don’t skip this one! The first layer isn’t a layer actually. It is just a scant spread of whipping cream to ensure the cookies stick to the pan. Finally, we will set the cake in freezer 5-6 hours or overnight. Voila! 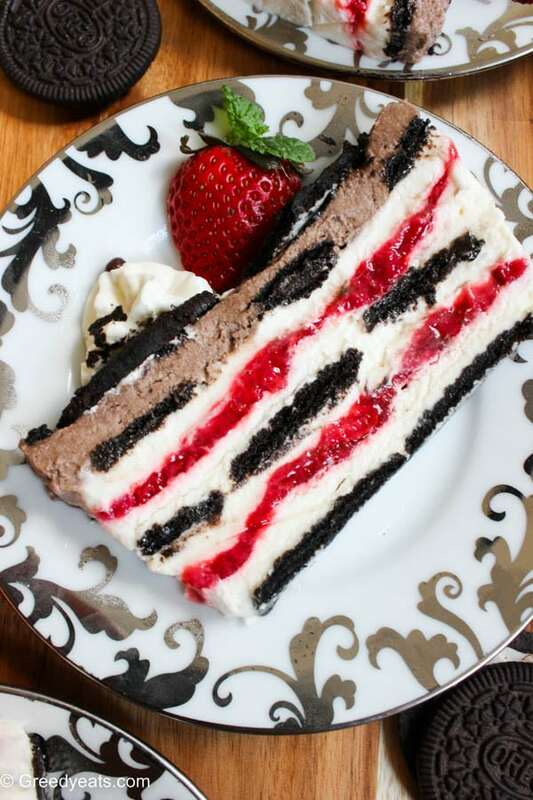 A light, fresh and cool oreo strawberry icebox cake is ready to devour! Just look at how beautiful and distinct the layers appear. Most noteworthy, only a handful of ingredients and 10 minutes of layering! 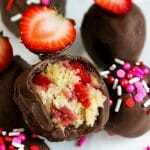 So you love strawberries and chocolate together! 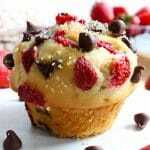 Seems like you will adore my strawberry chocolate cupcakes. Also this moist chocolate cake. So yummy! Want even more? Try this readers fave strawberry cookies. loaded with chocolate chips! 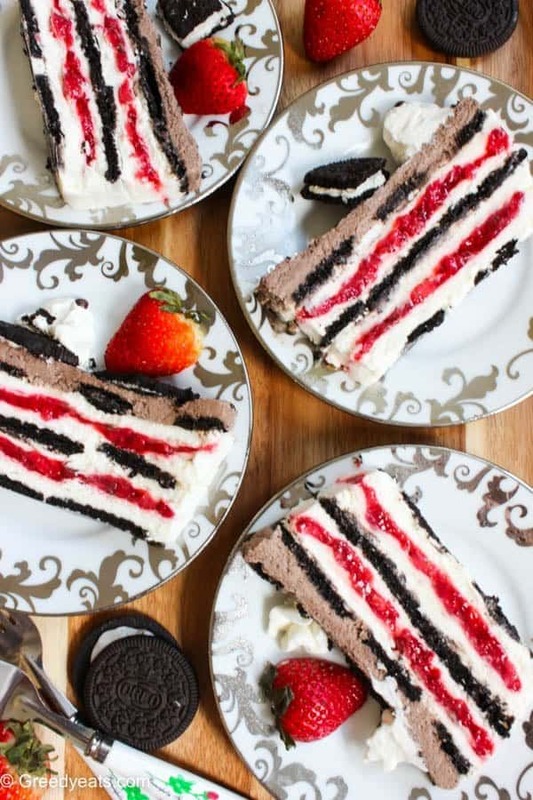 Give your oven some rest by making a cool and refreshing Oreo Strawberry icebox cake. Absolutely no bake and fuss free. Using a hand mixer, beat the cream, sugar, vanilla and leftover oreo cream till soft peaks are formed (DO NOT whip to stiff peaks). Now put approx 3/4 cup of the cream in a separate bowl and mix cocoa powder to it. Set aside. 1. Add lemon juice, water and cornstarch to a small bowl and mix well to combine. 2. In a small sauce pan put chopped strawberries and sugar together and stir over medium heat. After 4-5 minutes add in the cornstarch mixture to the pan. 3. Cook till the sauce thickens and coats the back of the spoon well. Set aside to cool. 1. 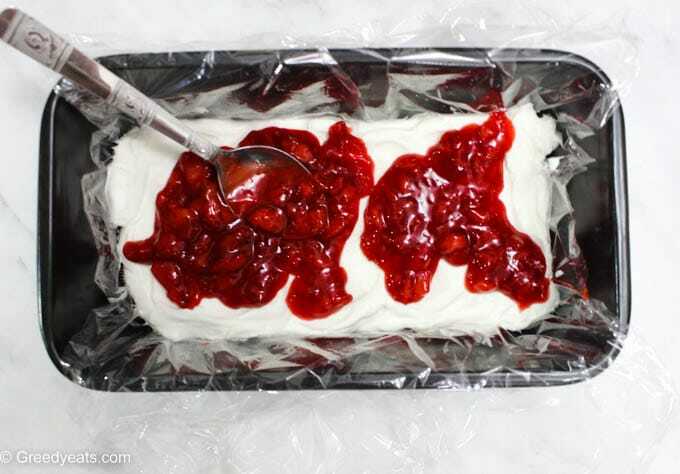 Line a 9x5 loaf pan with plastic wrap (leaving over hangs) and coat with a thin layer of whipped cream to stick cookies on. Layer oreo cookies (half of the whole cookie, cream removed) on the top! 2. Spread and layer 3/4 cup of the whipped cream on top of cookies. Layer half of the strawberry filling on top. Then again a layer of whipped cream. About 3/4 cup. 3. Line oreo cookie halves over the cream (as close as possible). And layer whipped cream over it. 4. Now layer the remaining strawberry filling on the whipped cream. Top this filling again with the remaining white vanilla whipped cream. 5. Final and third layer of oreo cookie halves come then. 6. Over these cookies, spread and layer the 3/4 cup of chocolate flavored whipped cream. Top with crushed oreo chunks. 7. 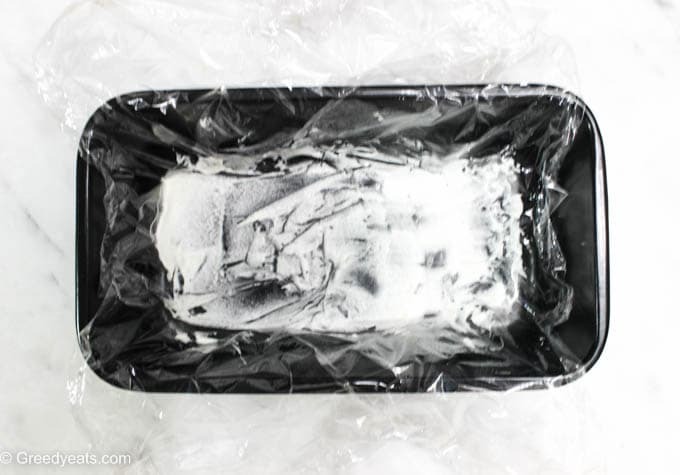 Cover with aluminium foil on top and let set in the freezer for good 4-6 hours. Overnight is the best. 8. Let the cake soften to room temperature for about 10-15 minutes before serving, or it will be rock hard! You could also soften it in the refrigeratore for about an hour or so before slicing. 9. Unmold the cake using the over hangs. Decorate with toppings (if doing so)Slice and serve! 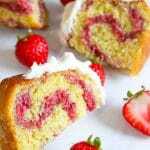 You can make your strawberry filling ahead and store it in the refrigerator for 2-3 days. The cake can be made and kept in the freezer 2-4 days in advance. Thaw in the refrigerator only when ready to eat! I am sure they will Cynthia! Let me know how it turns out. Wish I could have a small slice 🙂 Looks so nice and inviting with all the goodies. 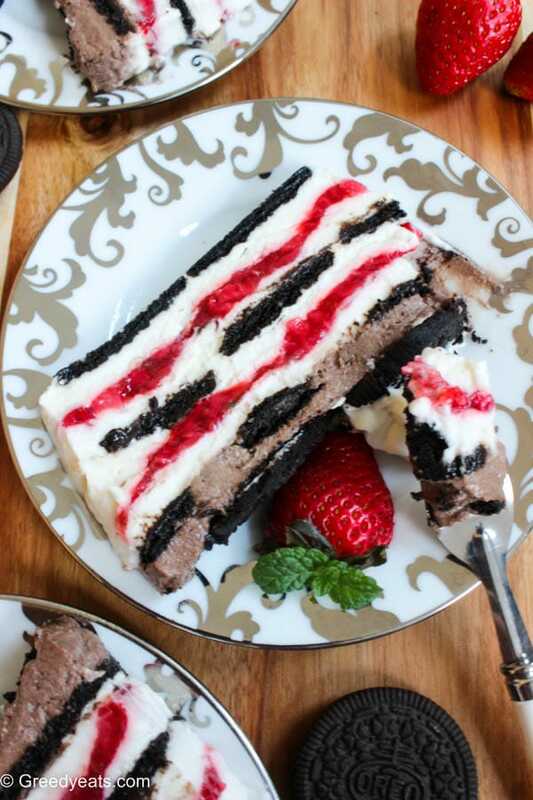 love this no bake cake with whipped cream , strawberry and oreos,sounds delicious ! So glad to hear it Nisha! This is beautiful ! It may sound silly, but I always tried to define ( with desserts that include Oreo) if the cookies are individual or not. You have demystified it all for me ! Appreciate it, really 🙂 Besides, while splitting them I can have my doze of sugar for the day 🙂 Thank you dear ! OMGGGGG THIS IS SERIOUSLY MAKING ME DROOL!!!! It looks incredible! Those layers are PERFECT! So glad you liked it Gigi! Thanks for stopping by and this wonderful comment. Absolutely Ashika! And it tastes so refreshing. I love cakes. Cooking or having new and different types cakes is one type hobby of mine. When i am free and get much leisure time , I try to make new types cake. I think your idea is unique so i wanna try it. thanks for sharing this recipe. It tastes delicious Michelle. I am sure you will love it. This is the stuff dreams are made of!! I would sit down with a spoon and eat the whole thing! Take care. Beautiful! I’m add this to my menu for the 4th! 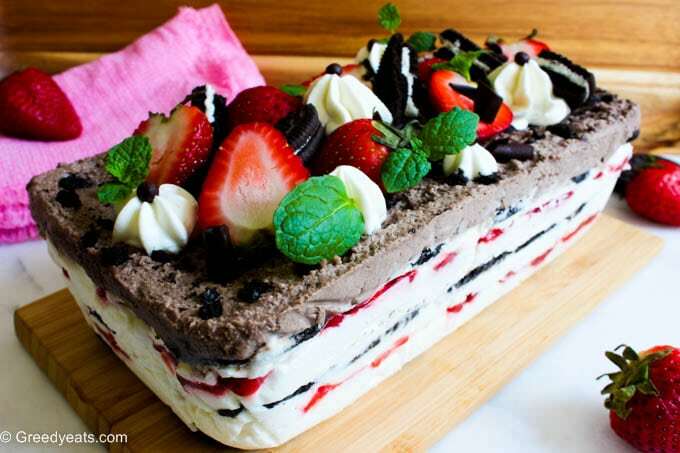 This icebox cake looks decadent and delicious! Love those layers, and your step by step photos are great! My kids will love this! They love ice cream cakes for some reason maybe it’s the cold fillings that make it different from regular cakes. You are right Emma! Cold fillings with so many flavors and texture are always a winner. Oh and I am loving your blog a lot! Amazing recipe. I want to make it for my husband birthday. Can you please tell me the measurements for 20 people? Should I make it in 2 batch or 1 will be fine?